Blackjack is a remarkably simple game. It's so simple that the rules can be printed on a business card sized piece of paper. These cards can be purchased in the casino gift shop, and that should tell you something. What does it say? It says that the real game, the game that makes vast fortunes for the casinos is not about how you play your cards. You're probably thinking that Blackjack is a card game, how can it not be about the cards? The answer has been hiding in front of you, in plain sight for as long as you have been a player. Once you understand the secret and begin putting it to work, your game will change forever. Dealers and Pit Bosses will recognize you as an advanced player and will treat you with a higher level of respect. But most importantly, you will win more and more often than you do now. With that said, keep in mind that no one wins all of the time, not you and not the casinos. Remember that statistics apply to a series of events and not to individual events. What you are about learn here is no guarantee on winning but rather a reliable way of moving the statistical advantage in your direction. This technique is easy to understand and easy to implement but there is one powerful variable that is entirely within your control, patience. I have seen hundreds of examples on a player on a losing streak say "I can't possibly lose the next hand". They substantially increase their bet out of sheer frustration and proceed to lose it all. The casino loves these players and rely upon this kind of behavior. Don't do it! Alright, so are you ready for the secret? In order to win more and more often you must bet larger amounts on your winning hands and bet less money on your losing hands. This is doable and doesn't require a crystal ball. The strategy you are about to learn makes it automatic. It's called a Progressive Betting Strategy and has been in use for many years by the bets gamblers around. It will quickly reduce your risk exposure and pull down handsome profits if you can be consistent and patient. Here's how it works. Pick a table with a minimum bet you are comfortable with. Let's say it's a $25.00 table. From now on we will refer to that amount as "One Unit". You place one unit out on the table and the dealer deals the cards. If you win, you let it ride. You now have "Two Units" betting on your next hand, but think about what it actually is. One unit is yours and one is house money. Now if you win the next hand you will pull back two units and keep two out to bet. At this point in your mini session you have recouped your original unit and taken one in profit. The two units out on the next bet are house money and your risk has been reduced to zero. If you win the next hand (hand three) you let the four units ride, pulling back four units if you win hand number four. The progression continues until you lose a hand. As you can see, even a short winning streak becomes wildly profitable to you. What happens when you lose a hand? Simple, you always go back to a one unit bet no matter what. This requires patience but is absolutely critical to this strategy. Remember that you have limited funds but the casino does not. You must manage your money for the long run while maximizing profits in the short run. Cards run in streaks and most people are four to five hands into one before they realize it. This strategy is automatic and will make you a better player, but it's still gambling. Be responsible and have fun but don't think for a moment that you are invincible, you're not. Set limits on losses and also a win limit. Learn to quit while you are ahead. There are no guaranteed wins in gambling but this strategy can make you a better player. Online slots aren't the only games that provide players with progressive jackpots. There are also plenty of poker games that offer up generous, life-changing prizes. Caribbean Stud Poker, Video Poker and Let 'Em Ride are the most common types of progressive poker games. Caribbean Stud Poker is a simplified version of Five Card Stud, in which the player competes only against the dealer. Each player is dealt five cards. All of the player's cards are dealt face down and only one of the dealer's cards is dealt face-up. After examining their cards, the player can choose to raise or fold. If the player raises, they must double their wager before the dealer reveals their hand. Based on traditional poker rankings, the player with the better hand wins. Most Caribbean Stud Poker games come equipped with a progressive jackpot feature, but players have to opt-in. This is usually done by placing a small side bet before the hand begins. In order to trigger the progressive jackpot prize, the player must have a royal flush of any suit. In some cases, small portions of the progressive jackpot pool will be awarded for other strong hands, such as straight flushes and four-of-a-kind hands. Video poker is quite similar, except players do not compete against the dealer. They are dealt five cards and they can choose to discard any number of them in order to improve their hand. The discarded cards are replaced, and the resultant hand determines how much the player wins. Progressive video poker games do not normally require players to place a side bet. Progressive jackpots in video poker are triggered whenever the player is dealt the qualifying hand: a Royal Flush. As is the case with Caribbean Stud Poker, players can earn up to 10% of the progressive pool for quads and straight flushes. Let 'Em Ride Poker plays out similarly to Hold 'Em Poker. The player is dealt five cards, two of which are face-down. After seeing the first three cards, the player can increase their bet. After the fourth and fifth cards are revealed, the player can also add to their ante. The lowest paying hand is a pair of tens, which offers the player a payout of 1:1. 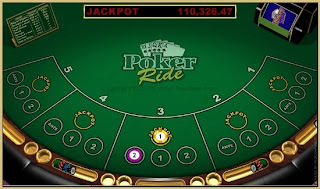 In Let 'Em Ride, the player must opt-in for the chance to win the progressive jackpot. If the player receives a Royal Flush, then they win the prize. All other hands receive pre-determined payouts and they are not eligible for any portion of the jackpot pool. There are plenty of progressive poker games available in the online casino world. Visit Hot Jackpots to find out which games best suit your tastes and preferred method of gaming. Sports Betting Systems - Should You Use One?